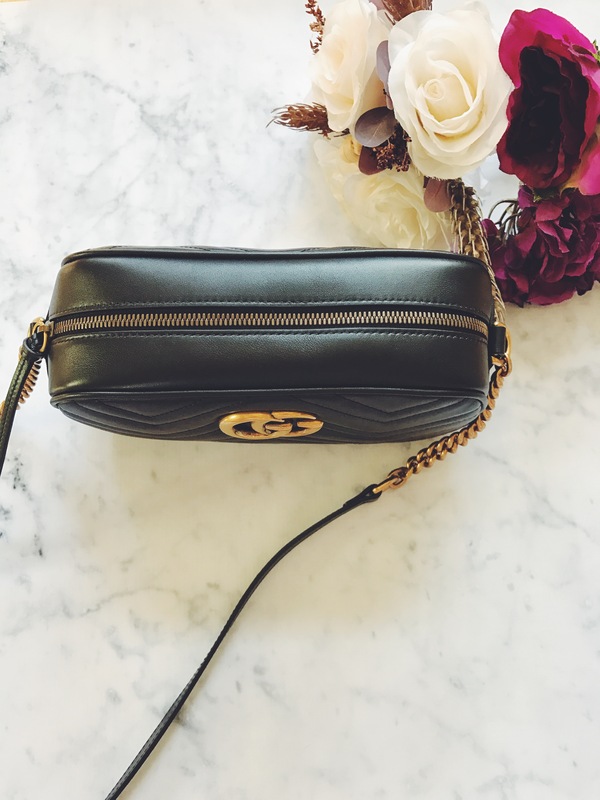 As promised, here is my Gucci bag reveal! 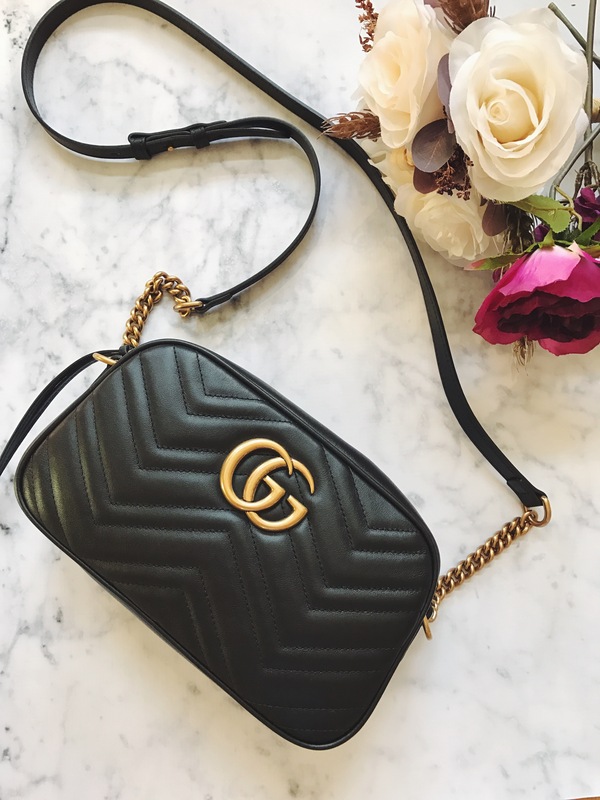 As some of my blogger gals know I was so back and forth between a few bags! I have been saving up for my first purchase at Gucci. I originally had my heart set on the Disco cross body bag in black. I knew that was what I wanted and had my eyes on it for a while. A lot of my gals have the bag and absolutely love it. For a small cross body, you can fit a lot in there. 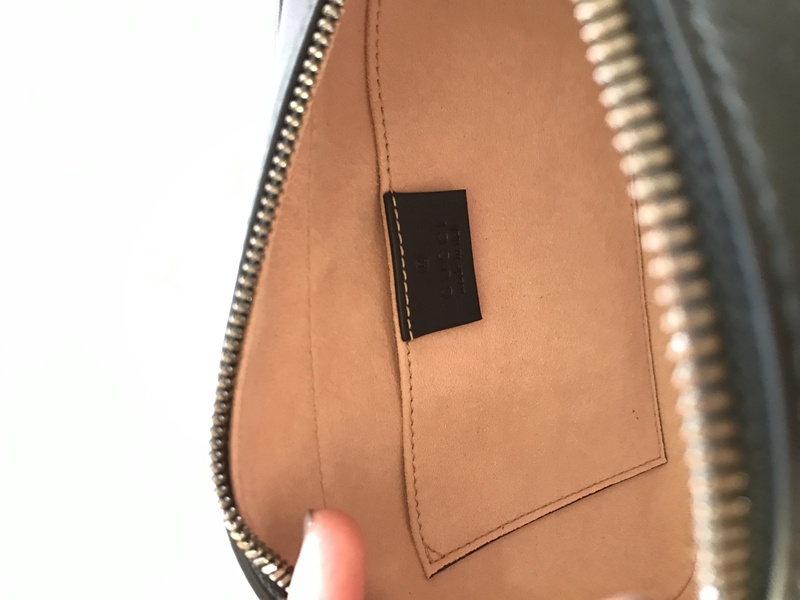 When trying it on, I was able to fit my LV flap wallet, an iPhone 7 plus and my small bag of makeup. The sales associate at Gucci, then brought out the Marmont Matelassé mini bag in blush. I absolutely fell in LOVE. The color was gorgeous, the quilted leather was beautiful and so classic. The only thing that had me, was the size of it. 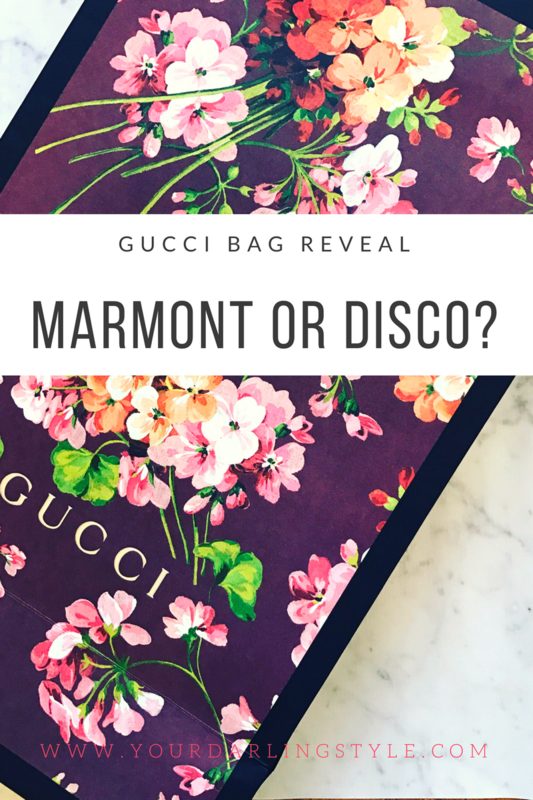 Both the disco and the mini Marmont are the same price, but I felt that the Marmont was so much smaller. At that point, I was completely confused and left the store to think it over. After having my heart set on the Disco, it then took me another week to make my decision. I went back to Gucci and knew I was getting the mini Marmont in blush. I then realized, I own so many bags in blush and really needed a classic black. I then decided to get the mini Marmont in black. I loved the overall style better and the brushed hardware. I asked the woman’s opinion and she then explained the disco was going to be discontinued. No! I was so torn at that point. I know I would love to own the disco bag at some point and was so nervous it would be discontinued. I knew I would no longer be able to get my hands on the bag. The woman explained to me that the Marmont is going to be replacing the disco. I loved the marmot mini but to be honest, it is so small. It is not an everyday cross body unless you just carry a card holder and a phone. I am very much like Mary Poppins and I carry so much on me; I knew I needed something larger. I love the brushed gold look on the hardware of the bag. 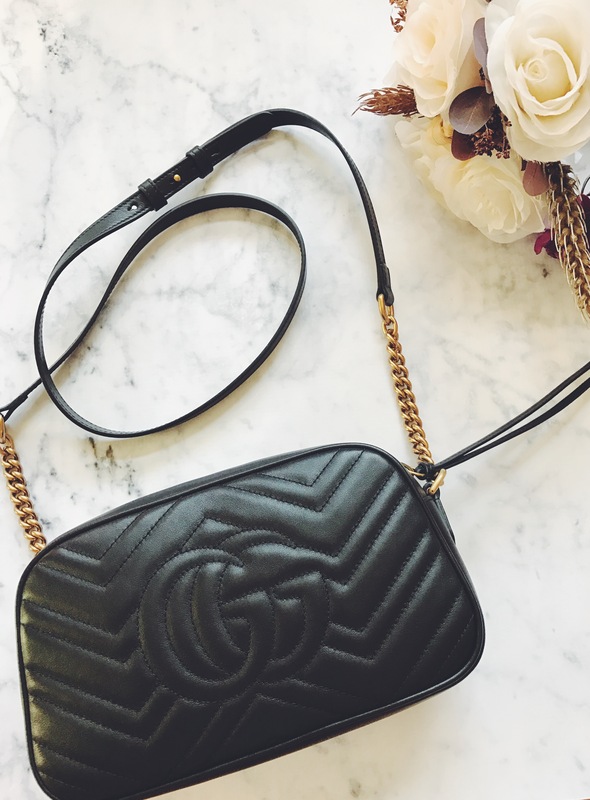 It gives the bag a vintage-inspired touch. The hardware is a brassy, gold and very durable. I loved that this bag had the metal hardware and felt that you could dress it up or down. Meanwhile, the disco bag was a bit more casual. I tend to dress up even when casual, so I figured this bag was a perfect in between for me. This has to be my favorite feature of the bag. You can wear it either side. I love that this side has the embossed leather GG. (This side reminds me of the Disco.) I love that when going out, picturing or styling that I can wear this bag either way and it will look completely different. You are getting two bags in one. My heart was completely set on this beauty when I tried it on. Can we also talk about how beautiful the quilted leather detailing is? I definitely fit all of my everyday essentials in this cross body bag. I am loving that it is longer and fits my lengthy LV wallet. The disco is definitely wider, but the Marmont is a lot longer in height and width. I will be doing a "What’s inside my bag" post soon so stay tuned darlings.